In August of 2016, I was brought on to develop the marketing department for one of the top custom bicycle manufacturers in the world. At its core, Speedvagen is a minimalist, modern race machine, built for each individual owner with a turnaround time of two weeks to two months, depending on the details. All design, fabrication, paint and buildout is done in-house in our Portland, Oregon workshop. We make about 200 frames per year with a staff of about 15. This translates to a ton (roughly 150) hours per bike - a lot of time sweating the details. With so much attention going into the bikes and the customer experience, we came to realize that no matter how good we do everything else, without a great fit, the bike will only ever be “OK”. How to bring our own fit methods to our customers around the world? We looked at how craftspeople throughout time have solved this problem, made some modifications to the traditional notion of a trunk show and launched our Fit Tour. Since 2015, our fit tours have taken us around the world to find our people. 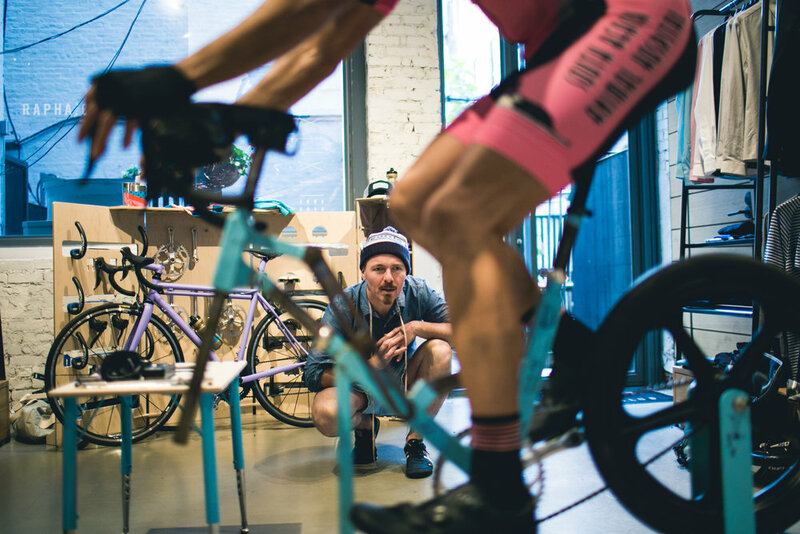 We ride their roads, share our bikes with those who have mostly seen them through the web and most importantly, these future Speedvagen owners get a full consultation and custom fitting session with founder Sacha White. The first major project was to design, plan, promote and execute the East Coast Fit Tour from November 4 - 21, 2016. The tour spent the first nine days connecting with different varieties of cyclist at three locations in New York City. We headed south to Philadelphia for a day, spent four days in Washington, DC and then stopped at partner locations in Greensboro and Asheville, North Carolina. I paired daily fitting sessions with several evening discussions, open houses, demo rides, five group rides, two Speedvagen-owner dinners and we introduced a new program called the Fit Clinic. The Speedvagen Fit Clinic is a three hour course where we share our fit principles and teach you how to apply them to your own riding. The goal is not to fit you, but rather to arm you with knowledge and confidence to dial things in on your own bike over the next several months of riding; This way when you’re riding and you’re feeling pressure here, or strained muscles there, you’ll be able to think critically and dissect the issue. Beyond planning, promoting, designing, managing public relations and executing, I also created content daily for social media coverage. The second Fit Tour and first one of 2017 took place in Taiwan, Singapore and Melbourne from February 16th - 25th. The entire tour was designed, planned and promoted from Portland. Partners were established at each stop to help with logistics, translation, promotion, event planning and documentation so when our team arrived they were set to dive right in. This tour more about fittings and less about awareness and yielded great results for us.